Why place Services Ad in Sikkim Express Newspaper ? Under the category of Services, advertisers can launch ads for various services they offer. In day to day life, people might require the services of private investigators, pest control, catering, dance and fitness instructors, and myriad other conveniences. Advertising in Sikkim Express’s Service column is sure to get your ad noticed, and ingrained in the mind of people who might urgently require your services. • Welcome to Pune Home Care, We provide services related to property such as, Property Inspection (Before taking possession of your new property), Property Management, Housekeeping, One Time Maint., Rentals & many more. 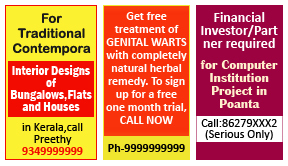 For more details pls visit our website :- www.punehomecare.com or pls feel free to call us on 9830567892. • Spiritual/Divine distant healing(over 2300 satisfied clients worldwide)problems and obstacles can be instantly removed from your life.plz visit www.ultimatedivinewisdom.com for more details and online consultation or call ,cochin,kerala. 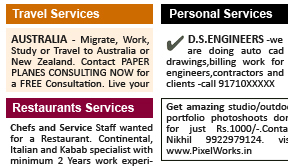 How To Book Services Ad in Sikkim Express Newspaper ? Book ads and view advertising rates for Sikkim Express services ad! Select advertising date(s) and clear payment via a host of online & offline methods. You can start your ad booking process by scrolling up and choosing your advertising location, or get to know more about advertising by clicking on the appropriate tab below.